Reserve Amazing Views to Remember Today! This was my 3rd time renting from Cabins USA and once again we were very pleased. For the last 3 years in March my husband & I plan an adult getaway with friends to Gatlinburg. I absolutely love the express check in!! Each year we’ve stayed in a different cabin. I have to say this wasn’t my favorite but I would still recommend it. One thing I really didn’t like is the fact you have this 5 bedroom cabin with a 4 person hot tub. We stayed in a 4 bedroom cabin last year and it had a way bigger hot tub. The t.v upstairs in the movie area either didn’t work or we couldn’t figure out how to use it. It would also be nice to have more lights on the balconies. This is the reason I gave it a 6 for amenities. Other than that it’s a very nice cabin and we were still very please even with the minor issues. Also the drive to the cabin can be a little scary especially when you turn into the driveway. Family FUNaway!!! What a beautiful cabin and the amenities are even better!!!! My family and I had the pleasure of staying here and were blown away by the views and the game room on the lower level! There was enough space for us all to have our privacy and plenty of space for us to come together and enjoy some family time. The drive up was an adventure in itself...LOL...but hey, its a cabin in the mountains with a view so you would expect to go up..up..and away to get there!!! :) We will definitely return again and use Cabins USA as our go to company! Thank you!!! We planned a friends trip with a party of 10. From the pictures we were excited to stay in this cabin and be together. The express check in went smoothly. Got an email the day before with the access code for the cabin. On arrival everything was clean and so spacious. The view from the balcony was stunning! With rocking chairs to watch the sunset and sunrise behind the Great Smokey Mountains. The cabin is literally at the top of the mountain. About a 10 min drive to Ober Gatlinburg. The driveway to the cabin is a bit scary at first because of how steep it is but you get used to it very quickly. Great place to stay with a large group. Highly recommend! This (2018) was our 3rd annual trip to Gatlinburg and our 3rd time staying in a Cabins USA cabin- this cabin was BY FAR our absolute favorite. The comfort, view, and cleanliness were beyond expectations. We will absolutely be back and hopefully stay in this exact cabin again. Thanks so much Cabins USA!! This cabin has a beautiful view of the mountains. It works very well for a large family and has many games for the kids. We truly enjoyed spending our vacation here and plan to return again next year. The view was most definitely amazing! We had two bears come visit while we were there, which was beautiful. The cabin was well equipped with everything we needed. We did have a little difficulty working the tv’s. The remotes were not put with the correct TVs. Also, I think there needs to be better instruction on the arcade games and how to turn them on. The car arcade game on/off switch was located on the back and it took us a while to find it. The rug in the living room has a corner that flips up, that the kids tripped on a couple of times. I think the corner needs to be secured to prevent children from tripping and hitting Their head on the coffee table or fireplace. These are just a few suggestions, nothing that would keep us from coming back. It truly was a great weekend and lovely cabin! Thank you! 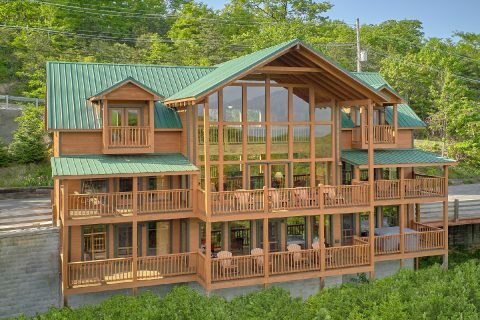 I have visited Gatlinburg and Pigeon Forge every year for the past 7 years and in that time I have never had a cabin I stayed in as neat and clean and beautiful as this cabin. My family and friends had the most wonderful time and made lots of memories together during this years vacation. We will all be returning next year and booking this cabin again for our stay. It truthfully feels like my home away from home and I’m so thankful to Cabins USA and Leigh (the owner) for being such wonderful hosts and having such an amazing home to allow us to stay in during our vacation!!!! By far the best checkin and check out process we have ever had with any company!!! Will stick with CabinsUSA for all of our future visits. The cabin far exceeded our expectations. It was just beautiful and very clean. The view was Amazing. We had a great time and will be back to rent this beautiful cabin again.